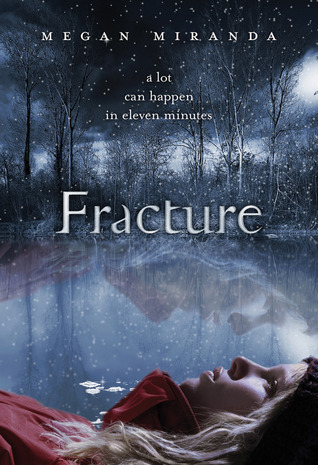 First Impressions: First I must say I really love the cover of the book which is one of the reason's that I decided to read Fracture in the first place. The other was that I kept hearing so many great things about it and reading such amazing reviews on the book that I knew I would have to read it soon after it hit the book stores. I really liked the idea behind this novel and after reading more into what Fracture was about I went to pick it up to read so I could see for myself how good this book is... and I am very happy I did. Review: The beginning of the book had a very strong hold on my attention. The plot was engaging and fast paced. Delaney who is the main character of the book falls through some thin ice while trying to run and catch up to her best friend Decker who is waiting far ahead. Delaney is sucked under the ice and soon to be rescued but was under the ice for far to long; 11 minutes. Delaney's heart and brain stopped working. She is dead, or was. Somehow Delaney came back and not even her Doctors can understand how she is alive and more so how she is doing okay. But Delaney is far from being okay because now some very unusual things begin to happen. She can sense or literally feel when someone is near her who is about to die. She does not know who to turn to about her new found ability, not Decker; ever know he is her best friend and the one who saved her from the ice. Decker seems to be tired up with "other" things (or someone). Delaney feels lost and depressed and does not understand what is happening to her until one day when she feel the "pull" of death near her but comes finds more that she thought she would...someone who knows exactly what she feels. Troy - who has the same abilities as Delaney although he is using his abilities in a different way. I don't want to go into anymore details about the story as a whole otherwise I would be giving to much away. I was going through some ups and downs while reading Fracture. While I really loved and was fully immersed in the story I found myself having to stop reading a certain points in the book. The beginning of the book I felt was amazing but toward the middle it seemed to slowed down some and I lost interest during a few chapters. One of the things I did not really care for was how whiny Delaney was towards the middle/end of the book. She keep talking about how her life was so depressing and awful. Like she would have been better of dead. She is a very dramatic and hard character to like. She was given a gift somehow and is pissed off at the world for having to life and deal with it. I can understand the author's point of having Delaney feel this distraught and angry; she went thought a lot in such a short period of time but it turned me off and began disliking Delaney for being so whiny. I will say I loved Megan Miranda writing style and how she was so detailed about the condition (ability) Delaney and Troy have. Her words are so expressive and give the novel such life. I so love to be able to get a clear image of what is happening in the book. I find it to be fun and more imaginative for the reader to read a novel and feel what the characters are feeling. Fracture is a great mystery with many twist and turns through-out the book. Although it was not as good as I thought it would be I did truly enjoy the story. Final Thoughts: I would recommend the book to others after reading Fracture although as for myself being told to read it many times my friends I was hoping for a bit more and did not find that "wow" factor I was looking for in the book. All in all I would say I enjoyed it and I think to be honest I did love the ending the most. I did shed a tear or two. Very touching. I'm so sorry you didn't like it as much as you thought you would :c I haven't heard anything about this book before I read it so I had no such expectations but I thoroughly enjoyed it, it was fantastic! I liked Delaney but I can see why you found her whiny. :) For me, Troy was the one who didn't do it.. I didn't really like him and he was a bit creepy too. Here's what I thought about this book. I feel the same about this book as you do. It seriously lacked the wow factor, and I don't know, I felt EVERYTHING needed development. I can barely remember anything about it now, except that there was something about ice, and some house went up in flames, and Delaney was very bland. Oh, and someone was a nurse? God, I don't even remember. Great cover though.